I have always said that there are one of three materialistic categories that people dream of: the dream car, the dream wardrobe or the dream house. For me it has always been the dream house. Ever since I was a small child I have dreamt of living in a beautiful home with warm surroundings, a crackling fire and a kitted-out kitchen. 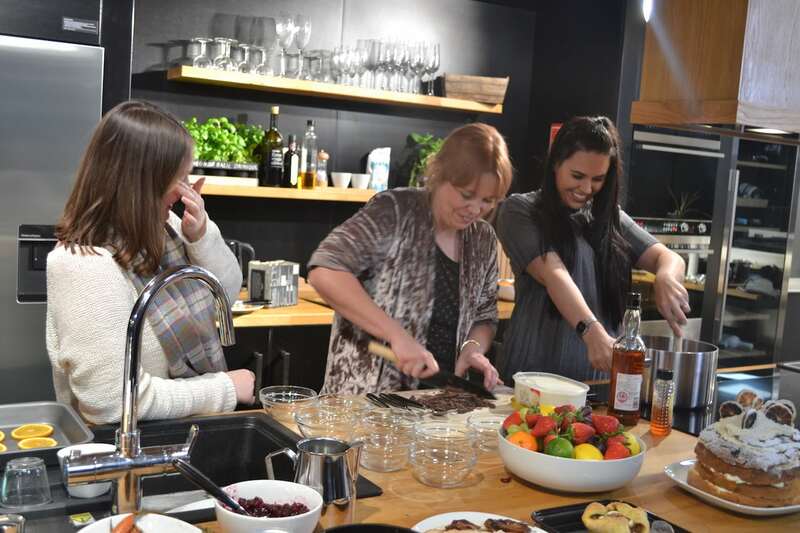 It is with bitter sweetness that I attend events like this one at Fisher & Paykel; drooling over gorgeous kitchen wares with nowhere (yet!) to put them! Before getting in contact I had never actually heard of Fisher & Paykel (had you?) but I learned that they’re a massive luxury Kitchen brand on the other side of the planet in New Zealand. 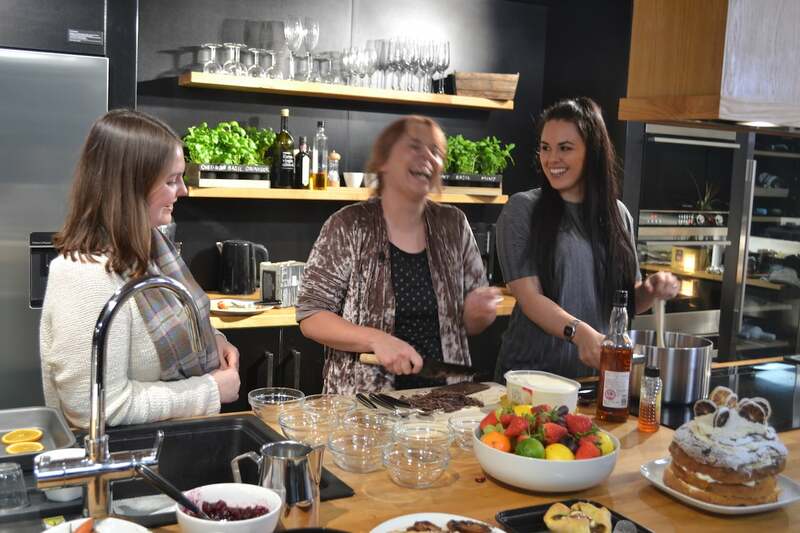 They boast that since 1934 they’ve been looking at innovative, ergonomic ways to deliver luxury kitchen solutions and walking around their showroom there was no end of oohs-and-aahs from myself. I tugged at every handle wondering what was inside and was surprised a number of times seeing as they do things a little differently. I discovered a dishwasher in a mid-height draw; where you can stack your dirty dishes without bending over constantly. 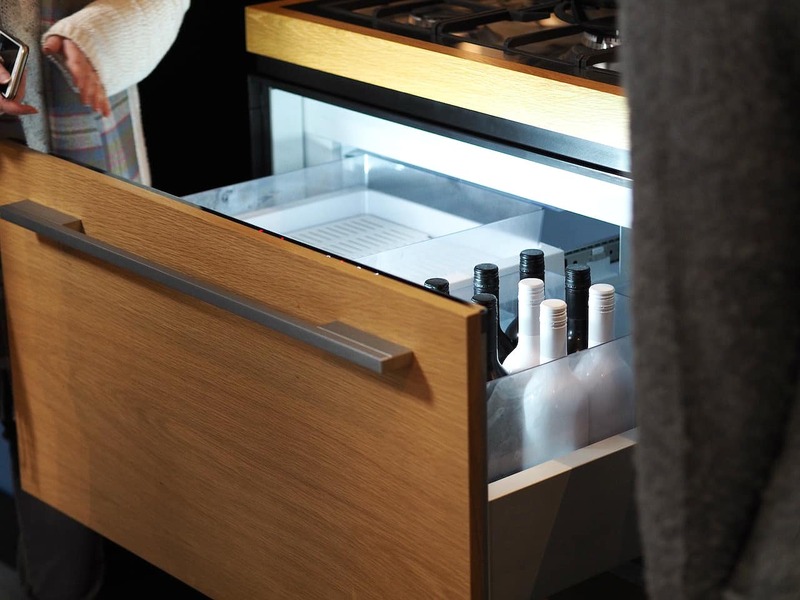 I found another unassuming draw serving as a neat fridge for your white wine and bubbly! Less surprising but most desirable was their lovely wide, double-door American style fridges. The absolute kitchen dream! Once I’d tugged at every door, peered in every nook & cranny, played with every touch screen (jeez I really am a kid in a candy shop huh?) my attention steered towards the good smells coming from the kitchen, where a film crew were catching chef and food stylist Clover Hutson in action. I instantly took a liking to Clover who was as forthcoming with her excitement over food as I am! 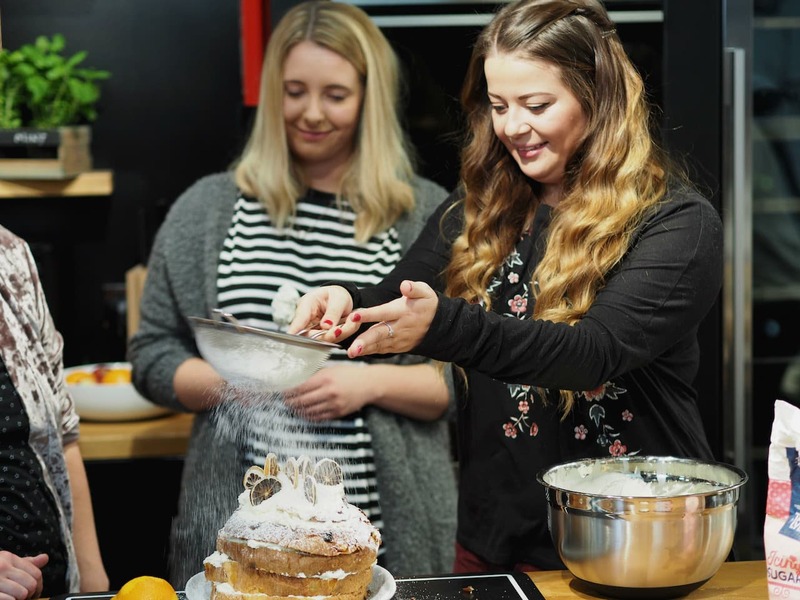 Clover is a chef, demonstrator and food stylist who was treating us to a Christmas dinner as well as tips on delivering maximum wow factor without spending forever in the kitchen away from the fun. 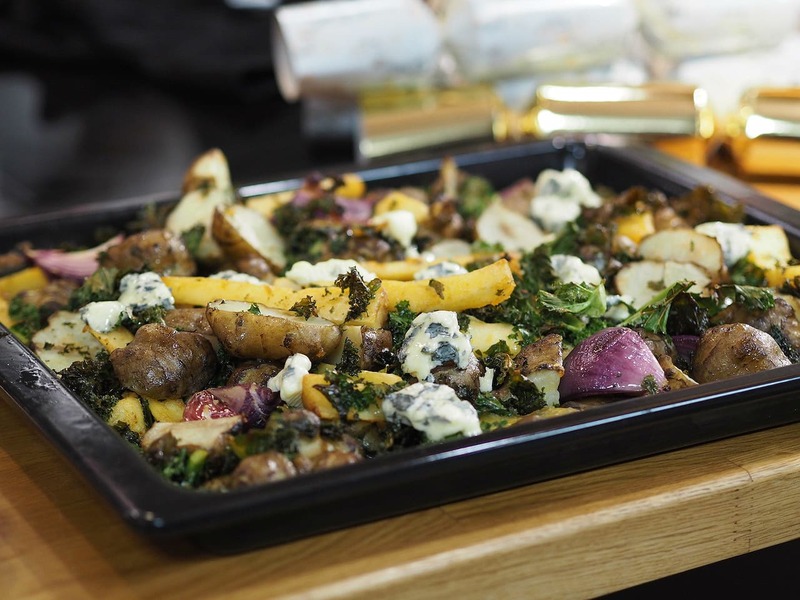 One of Clover’s recipes which was a bit different from the norm was this lovely tray of roasted veg with chunks of blue cheese crumbled over and left to melt in the oven. This adds a whole other level of richness and indulgence which I loved. 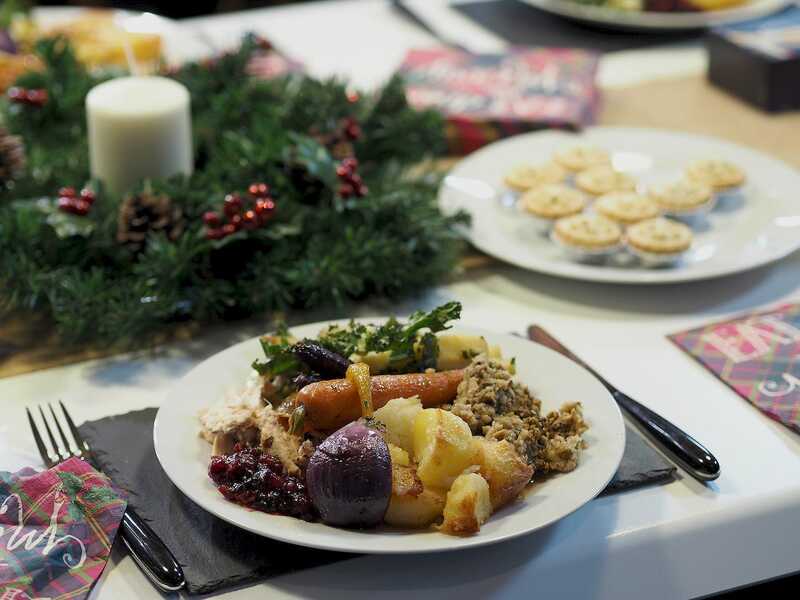 Blue cheese on Christmas dinner is A-Okay in my books and definitely one to try! Dessert was a team effort with two to make and devour! 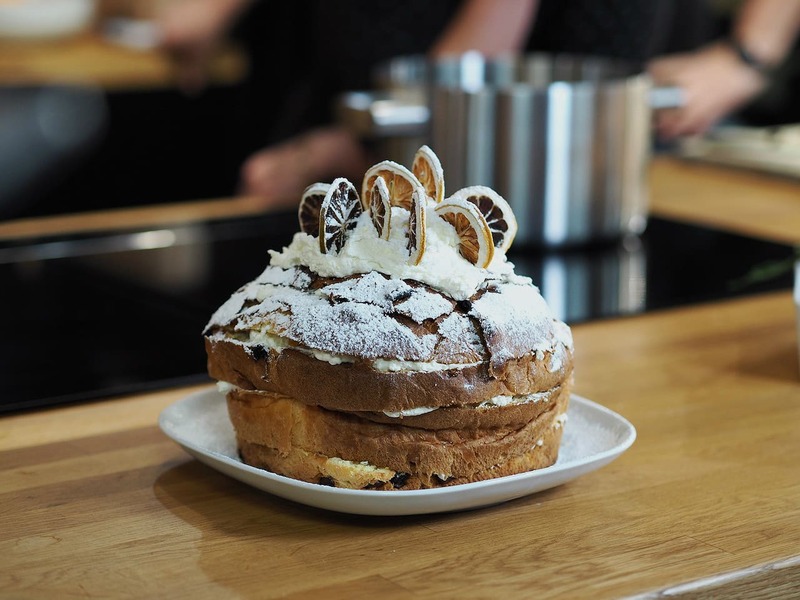 First up was a quick and crowd pleasing Panettone cake which Sophie and Victoria got stuck into creating. For the orange cream: place the cream, two tablespoons of icing sugar, the Cointreau/Grand Marnier, the zest of one orange and a dash of vanilla in a large metal or glass bowl and whisk until stiff. Next, cut the panettone horizontally into four or five slices. Layer the cream and slices and top with the remaining cream. To decorate place dried orange slices into the cream topping and sprinkle generously with icing sugar. The next sweet treat was about using up a crowd dividing dessert: the Christmas Pudding. I for one love Christmas pudding (how can you not it’s bloody delicious!) so I was first to volunteer as Clover’s assistant for this one! This one’s mega low maintenance because there’s no measuring (ideal when you’re a few drinks in on Christmas day). You add the Christmas pud pieces to a pan on a medium heat and once they’ve fried a little and developed some nice crispy bits, you add the rum and honey and cooked until nice and hot. 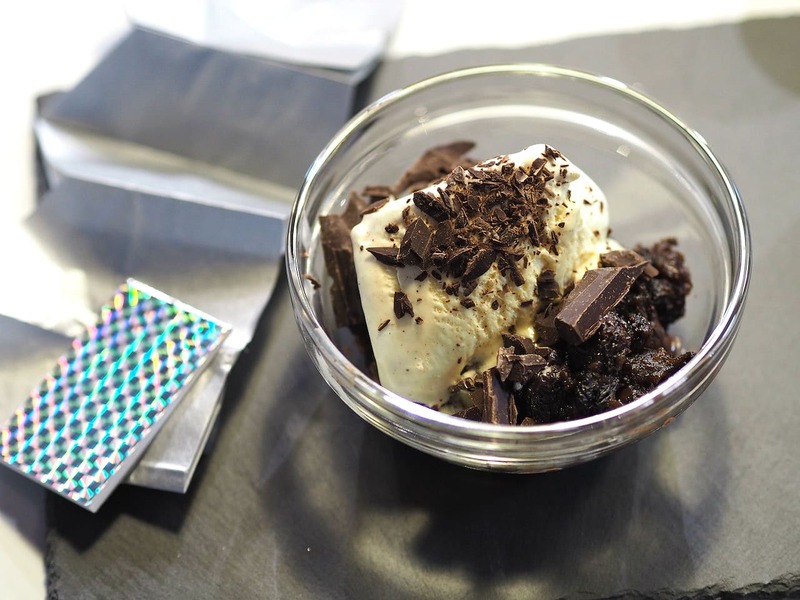 Then all you have to do is layer up the pudding, ice cream and chocolate shavings until you’re filled your glasses. 10 minutes max to make this; simple but so good (Especially because Clover used a lot of rum. Good work). 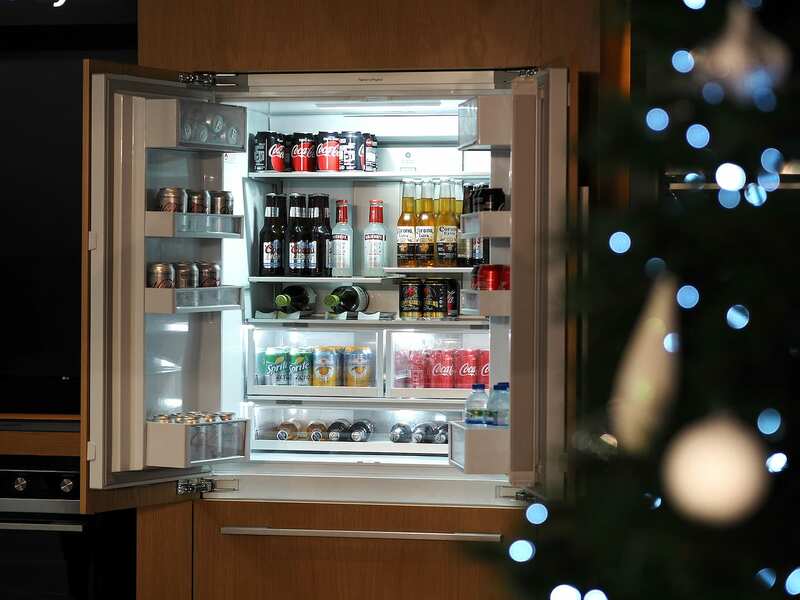 Top work Fisher & Paykel for stoking my festive spirit and kitchen dreams… I wonder if I can fit an American fridge in my stocking? 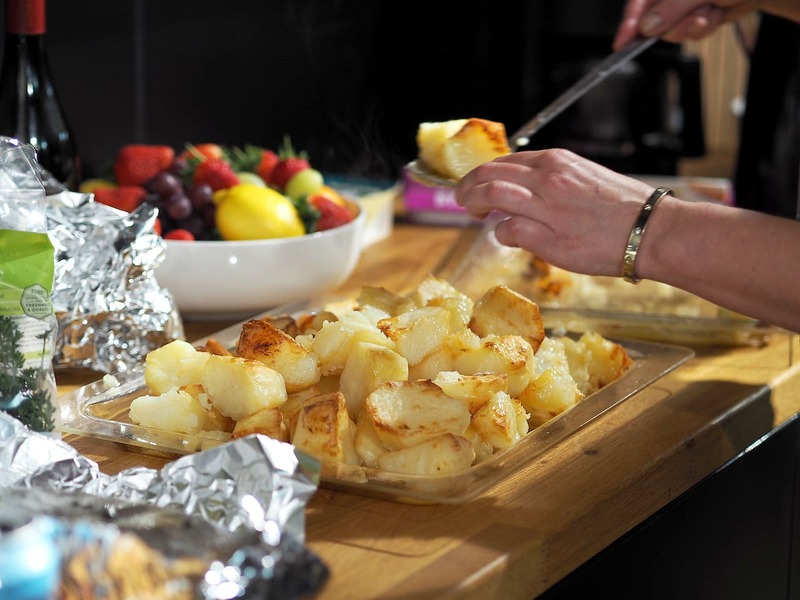 I really enjoyed the new ideas that Clover brought to the table (pun intended), there’s a video below showing a bit more of what we got up to along with a bit of festive potato enthusiasm from yours truly! This may well be my last post before Christmas, so I hope you all have an amazing day! 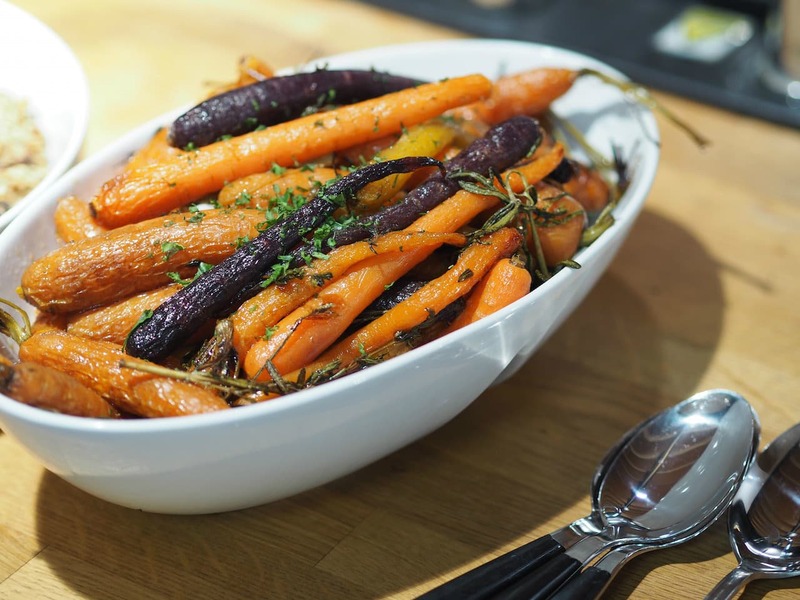 I love seeing what everyone’s eating so please share your pics with my on Instagram!